New book explores ways to cut industry's greenhouse-gas footprint. As concerns about global warming mount, the corporate world is feeling the heat. Reports of shrinking ice caps and rising sea levels (which have been linked to heat-trapping greenhouse-gas emissions) have amped up the pressure on businesses to "decarbonize" their operations. But when it comes to the logistics end of those operations, it won't be easy. Experts say logistics (which accounts for an estimated 10 percent of total carbon emissions worldwide) will be one of the toughest economic sectors to decarbonize, due to expectations of rising demand for freight transportation and the industry's heavy reliance on fossil fuels. So what can a supply chain professional do about the problem? A new book may offer some answers. 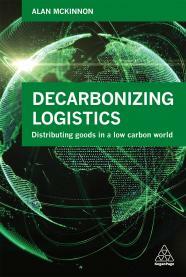 In Decarbonizing Logistics: Distributing Goods in a Low Carbon World, author Alan McKinnon examines several approaches to cutting greenhouse-gas emissions: restructuring supply chains, shifting freight to lower-carbon transport modes, using vehicle capacity more effectively, and transforming energy use in the logistics sector. McKinnon, who is a professor of logistics at Kühne Logistics University in Hamburg, Germany, examines the options from both a technological and a managerial standpoint for all the major transportation modes. "The greenhouse-gas footprint of logistics is large," Jean-François Arvis, lead economist for The World Bank, said in a review on the publisher's website. "Reducing it relies on several mechanisms because logistics involves many activities and participants. This book disentangles this complexity and proposes a clear framework for reduction." The book will be available at the end of June from Amazon.com and other booksellers. Feedback: What did you think of this article? We'd like to hear from you. DC VELOCITY is committed to accuracy and clarity in the delivery of important and useful logistics and supply chain news and information. If you find anything in DC VELOCITY you feel is inaccurate or warrants further explanation, please ?Subject=Feedback - : Putting logistics on a low-carbon diet">contact Chief Editor David Maloney. All comments are eligible for publication in the letters section of DC VELOCITY magazine. Please include you name and the name of the company or organization your work for.